With more than 25 student organizations, there’s always something to get involved with in C&IS! Student organizations and individuals pursuing scholarship activities to benefit the College of Communication and Information Sciences are encouraged to submit an application for funding. Funding request are reviewed three times each semester by the Student Executive Council and awards are limited to $500 per student organization or individual each semester. Tisch Student Services and External Relations wants to help you get the word out about events, applications and deadlines related to your student organization. Reference the 2017-18 Media Guide for how to best inform your fellow students about all the exciting things you have going on! C&IS is committed to developing ethical student leaders with a variety of skills who will lead with integrity far beyond their time in the College. C&IS offers three college-wide student leadership opportunities where students are either elected by their C&IS peers or selected through an application and interview process. An appellate and judicial body composed of student justices who maintain high ethical and academic standards. Members develop ways to promote academic integrity. Selection is based on an application and essay submission. Members serve to further the mission of C&IS by providing services, promoting pride and increasing awareness of the College both to internal and external audiences. Ambassadors serve as the of cial representatives of the College at various events, such as game-day tailgates, recruitment receptions, Board of Visitors meetings and more. Selection is based on an application and interview process each spring. Composed of C&IS SGA senators, representatives of C&IS student organizations and elected delegates for each major. The Council exists as a network for students and organizations of C&IS to connect, collaborate and serve as liaisons between the departments and students. C&IS has several student organizations that are designed for students in multiple majors. This organization promotes the fields of communication and offers members special invitations and VIP access ranging from social activities to prominent speakers in the field of communication. CCSS is open to all C&IS majors and minors for membership. There is a membership fee. Upon graduation, students can transition their membership into the alumni group, Capstone Communication Society, that follows the same mission. National journalism and mass communication honor society. Invitations are issued to juniors, seniors and graduate students in advertising, public relations, news media and creative media who rank in the top 10 percent of their class. Develops successful leaders through networking events, professional etiquette lessons and business literacy seminars. The Association for Women in Sports Media assists aspiring sports media professionals in mentorship and networking with women in the sports media industry and provides an avenue for internships, scholarships and career-enhancing opportunities. WVUA-FM is the University’s only student-operated radio station. WVUA-FM is staffed by approximately 70-90 student volunteers from C&IS and across the campus of The University of Alabama. At C&IS, learning isn’t limited to the classroom. With an emphasis on experiential learning and an understanding of the value of cultural immersion, C&IS has travel programs specifically designed for students in the College. C&IS In Los Angeles is a faculty-led, summer internship experience. This immersive program brings students to live and intern in Los Angeles where they study the media and entertainment industries alongside faculty who are experienced in the industry. Offered during UA breaks, Industry Immersion helps students launch their career through participation in professional development and high- powered networking. 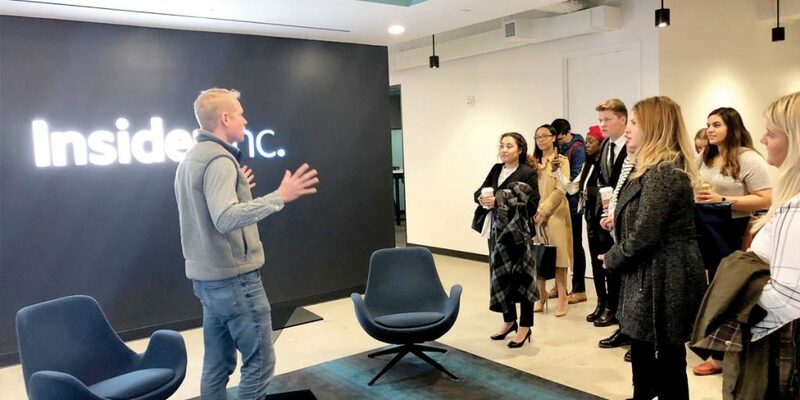 Students travel to New York, Nashville, LA, Seattle and other flourishing cities where many participants have secured jobs and internships after participating in a trip. Many of our student organizations are aimed at a specific area of study, to bring a supplemental and experiential learning experience for their members. The purpose of the Student Initiative Board is to act as a liaison between students and faculty of the Advertising and Public Relations Department in C&IS. 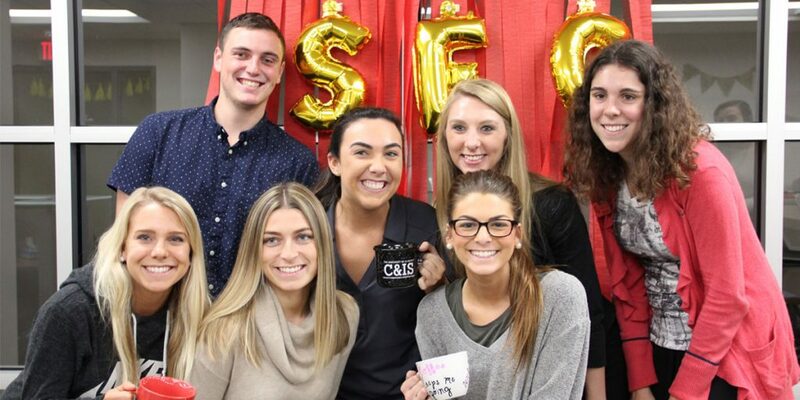 SIB prepares members to become leaders now and in the future by working alongside students as a mentor, as well as working alongside faculty to perform duties such as conducting interviews for candidates for positions in the A+PR Department. 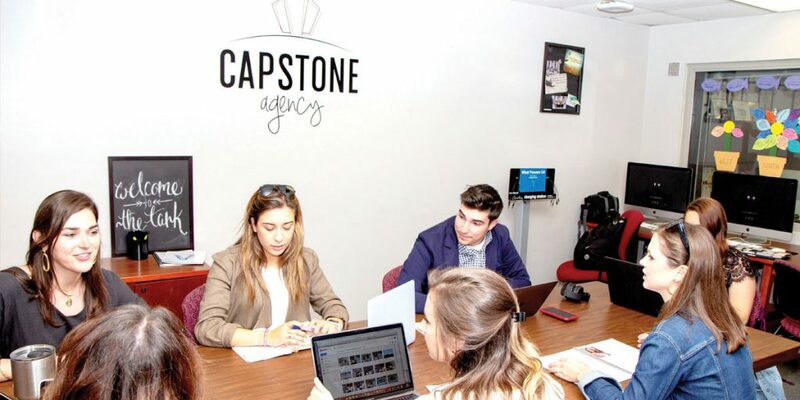 Students research, plan, execute and evaluate communication campaigns as part of their work at this student-run, integrated communications rm that serves clients both on and off campus. This club is af liated with the American Advertising Federation. Members must have had at least one advertising course, be in good academic standing and be interested in an advertising career. 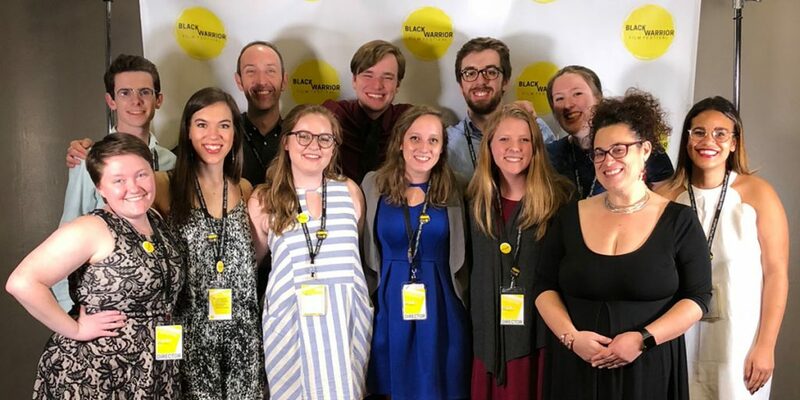 As members of this statewide organization that’s part of the Southern Public Relations Federation, students participate in competitions and annual conferences. This nationally recognized organization’s chapter offers career-building activities, scholarships, mentorship programs, national conferences and more. Juniors and seniors are competitively selected to compete in the American Advertising Federation’s National Student Advertising Competition. The Alabama Debate Society is an organization aimed at bringing debate and its educational benefits to high school students in the Tuscaloosa community and across Alabama. As part of the University’s competitive speech program, members attend regional and national intercollegiate forensic competitions. Thirty scholarships are awarded each year to active students. This national honor society is for those who have excelled in forensics and have distinguished academic records. Invitations to join this national communication studies honor society are issued to juniors and seniors in communication studies who rank in the top 10 percent of their class. Alabama Detours are short documentaries that air between programs on WVUA 23. Nearly 100 of these mini-documentaries have been produced by C&IS students, and any student is welcome to submit entries. The APSE Tuscaloosa Student Chapter provides UA students with career-building tools and opportunities in the sports media world by hosting guest speakers, workshops and other creative learning and networking events. The Black Warrior Film Festival (BWFF) is a competitive, annual showcase of student films and emerging talent from college students across the South. BWFF is an annual event produced by students, for students. Af liated with a national organization, this club provides information on careers, jobs, internships, scholarships and other opportunities, with a focus on minorities. An af liate of the national organization and open to all UA students, NAHJ offers professional development with a focus on the issues facing Hispanic journalists. Part of the world’s largest professional organization exclusively serving the electronic news profession, this club is open to all students. This group is open to all students interested in all areas of professional news media regardless of medium.